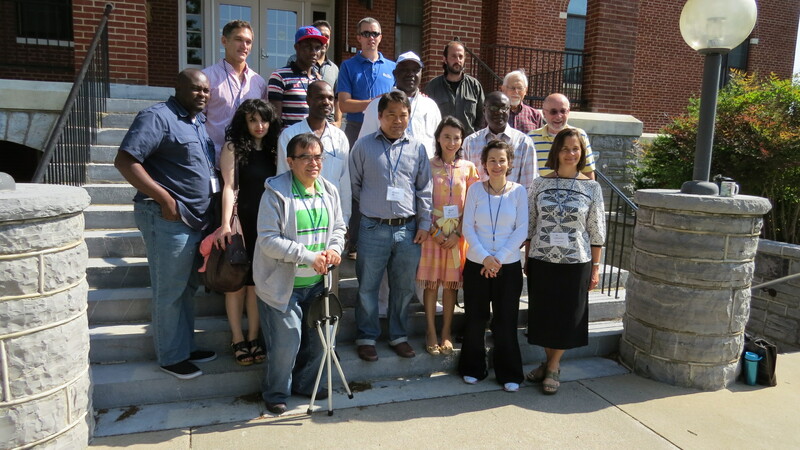 The SPI Conflict Analysis Class of last May at Eastern Mennonite University, Harrisonburg, VA.
Last May I took a graduate school course on conflict analysis in the Summer Peacebuilding Institute (SPI) held at Eastern Mennonite University in Harrisonburg, Virginia. The 16 students in the class represented several countries, ethnic backgrounds and religions from around the world. Each day we sat at tables in groups of four or five with a different mix of students. We collaborated on dissecting some aspect of human discord, usually in preparation for a class presentation. We were all in the class for the same reason. We had a strong interest in understanding and resolving conflict by peaceful means. 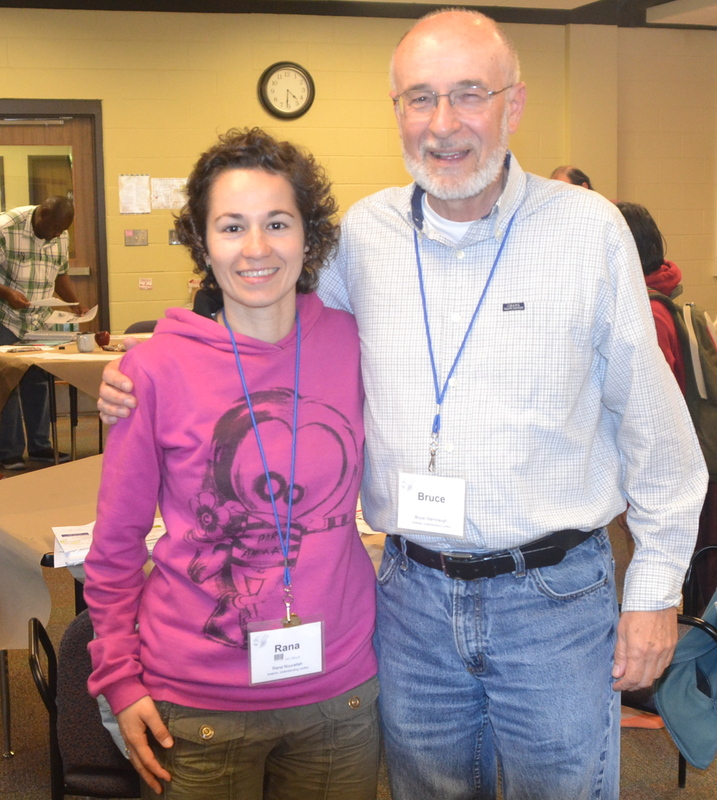 Rana and me in the SPI classroom at Eastern Mennonite University. I couldn’t have imagined how meaningful the class would be. Nor could I have anticipated the events that would unfold long after the course work was finished. Keep in mind that most of the students were intensely involved in some aspect of peace building in their respective countries. Dangerous conflict was a daily occurrence for many of them. Azerbaijan, Iraq, Kurdistan, Somalia, Syria, Miramar, and Haiti were a few of those places. Back home the official duties of class participants varied as much as their backgrounds. Some engaged in peace building through non-governmental agencies. Others were pastors, teachers and even politicians. The goal was to learn how to analyze conflict, and apply appropriate peace building skills constructively. Upon returning to their home country, they would instruct others in what they had learned or directly apply peace aspects in their vocations. Meeting with new classmates each day provided a global perspective on the too many conflicts around the world. My problems paled when compared to some of the survival stories told to me privately. Their personal, troublesome stories humbled me. I was especially impressed with Rana, an energetic young woman from Syria. The news out of that country was not good. Aggressive conflict was wreaking havoc on her homeland. Yet she remained upbeat and actively engaged in class projects. When the course was completed, I tried to gather any contact information that I could. I wanted to stay connected to my new friends. I knew that I would be unable to communicate with some of them simply for security reasons. I certainly didn’t want to compound the risks they already faced. Once home I did manage to communicate with a few of the students, mostly via Facebook, a popular social media website. Even in the midst of the fighting, I was able to share periodically with Rana. But I kept the messages to mostly short well wishes. When the fighting in Syria escalated, including the use of chemical weapons, I became rather concerned. Then the last Sunday morning of 2013, I received a message from Rana that she was fine. I felt relieved as my wife and I headed to church. I knew we had a special speaker that morning, but I didn’t know who or from what organization. Prior to the service, I was introduced to the guest speaker, Sarah Adams, who was the Mennonite Central Committee country representative to Lebanon and Syria. I recounted my SPI experience, and asked Sarah if she happened to know Rana. Before I could say Rana’s last name, Sarah happily replied, “Oh, yes. I know Rana well.” She assured me that Rana was safe and still working for peace whenever and wherever she could. I was thrilled. Imagine the odds of the three of us interconnecting via Virginia, Syria and Ohio. It really is a small world after all. Interesting work you are doing Bruce. It is quite unusual to find a writer from the USA who understands what is really going on with the Syrian people. They are not all wild eyed rag heads determined to kill everybody. One time in Aleppo I was in a small square. On one side there was a mosque, another side and synagogue and another side a church. The Syrian people know how to get on with one another. It is the government and other outside forces that are trying to divide the people. Indeed. Part of the problem here in the US is that many of the government leaders think there are only good guys and bad guys. The people of Syria, the one you so nicely shared, know better. Thanks, Melodie. I already emailed the link to Phoebe. Thanks so much for posting my story.